Included in the cost-cutting measures the government announced in their May budget were measures designed to cut the cost of primary and secondary education – at the expense of teachers and students. Included in the budget were cuts to teacher numbers by way of “natural attrition”, “performance-based pay” for teachers and alterations to funding ratios that would have seen larger class sizes – especially in intermediate and middle schools where funding for technology subjects was to be seriously reduced. The reaction from the education sector was swift and damning. Some schools, especially intermediate schools, stood to lose as many as seven teachers. Most public schools would lose at least one or two. Teachers’ unions from across the sector united along with principals’ and parents’ organisations in a series of sector-wide meetings to organise opposition to the assault on education. They succeeded in squeezing a concession from the government almost immediately. Only a two days after the budget was released, Education Minister Hekia Parata quickly back-tracked, claiming the government didn’t realise the extent of the damage the cuts would cause and announced measures to limit teacher losses to no more than two per school. But simply limiting the losses wasn’t enough for teachers, whose jobs were still under threat. They stuck to their guns and threatened industrial action. Faced with an educators’ revolt and the threat of strike action, the government was forced to back down. On June 7 – barely two weeks after the budget – the government announced that it was abandoning its plans to increase teacher-student funding ratios. Conceding on the issue of class sizes is a blow to the government and their big business backers because it shows up their weakness. The economic crisis has weakened them considerably but they don’t want to do the one thing that could actually solve the crisis – writing off the debt. Their only solution is more cutbacks, and when they’re met with staunch resistance – whether at the Ports of Auckland, AFFCO or in the schools – they can be forced to back down. The government’s attempts to cut education spending are part of a set of pro-business ‘neoliberal’ policies that have a long history in the education sector. Neoliberal reforms in education began after the Labour Party was re-elected in 1987. Using the language of “parental and community involvement” and “improved learning opportunities”, the Lange government set about extracting what Treasury called “value and efficiency” from the education sector. The wealthy businessman Brian Picot was appointed to chair a commission tasked with reviewing the management structures and the “cost-effectiveness” of the education system. Following the Picot commission’s report, subsequent governments restructured the education system. School zoning was softened and then abolished, a move which in practice allowed wealthiest schools to cherry-pick the highest achievers. Much of school management was ‘devolved’ to a Board of Trustees for each school, creating competition between schools and encouraging the movement of resources and experienced staff away from rural and low-decile schools. More recent reforms have also emphasised the degree to which education is supposed to be preparation for entrance to the workforce. NCEA, while a welcome move away from the old system of norm-referenced testing, was introduced into schools in 2002 with an emphasis on how it would enable potential employers to asses a student’s capabilities. A new regime of testing primary school children against ‘National Standards’ in the core areas of reading, writing and arithmetic were introduced by the National government in 2010. Along with limiting the cost of education, this has been the real thrust of education reform, designed to a mass of young workers ready for an increasingly basic, low-wage economy. Gone are the experimental schools and exploratory learning of the 1960s and in is the “core curriculum”, individual excellence and more and more testing. But none of this has occurred without resistance. Teachers are one of the best organised sections of the workforce and curriculum changes have added hours to their workload, while budget cuts have put pressure on their pay. The Post-Primary Teachers’ Association (PPTA) has led the way in fighting back. 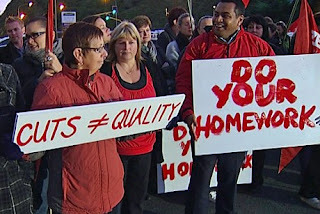 With the introduction of NCEA in 2002 and the increased workload it represented, the PPTA demanded a pay rise and NCEA allowance for teachers in 2001 negotiations for their collective agreement. When they were rebuffed by the government, the PPTA initiated a series of one-day strikes that started a national movement. Stoppages occurred throughout 2002, teachers at several schools took their own initiative in embarking on unauthorised ‘wildcat’ strikes when it became clear that one-day, national actions were not enough. Dissatisfaction with the haphazard introduction of the new qualification led many students to join their teachers on the picket line and culminated in a series of high-school walkouts that spread like wildfires up and down the country. Such was the disruption that when the negotiations collapsed again in 2007, the very threat of strike action was enough to bring the government back to the table. The PPTA struck again in 2010, seeking a 4 % pay increase, measures to increase teacher recruitment and – importantly – a maximum class size of 30. Thousands of teachers around the country rallied, engaging in a one-day strike followed by rolling stoppages. Foreshadowing the arguments to be used in the 2012 budget, the government cited studies purporting to prove that the relationship between teachers and their students not class size, was the determining factor in student success; and reprimanded teachers for seeking a pay rise greater than other public servants had been able to win. While neither the 2002 nor the 2010 strikes were successful in obtaining all their aims, they did succeed in making a number of gains. They forced the government to grant a small NCEA allowance in 2002 when the government intended not to give one. Significantly, the PPTA also succeeded in driving government claw backs around class sizes from the table in 2010. Perhaps most importantly however, their combativeness has enabled teachers’ unions to maintain their organisation and cohesiveness during a period in which most of the union movement has been in decline. And it was this strength of teachers’ unions that was instrumental in defending class sizes after this years’ budget. The fight doesn’t end with class sizes, however. The National government remains committed to cutting costs in education, saying that schools will have to find other ways to save money. National also remains committed to introducing “performance pay” – something teachers have long resisted. As anyone who has ever been subject to performance pay knows, it is a measure designed to increase workloads at the expense of job security. 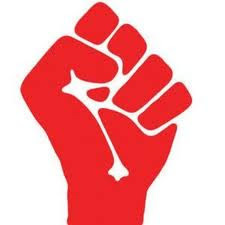 But teachers have signalled a willingness to fight – and as the victory over class sizes has shown, if they stick to their guns it’s possible to win.